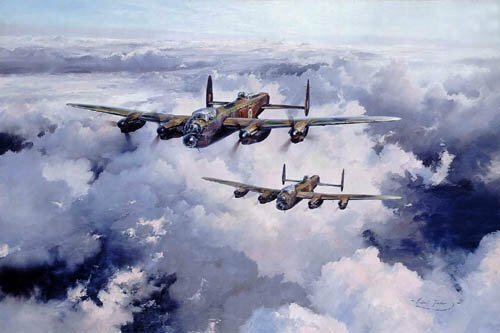 A superb study of a pair of Lancaster heavy bombers as they set out on a mission over occupied Europe, painted against a powerful cloudscape. Both Bill Reid and Norman Jackson, who have signed the prints, won Britain's supreme award, the Victoria Cross, flying in Lancasters. Overall Print Size 24" x 20"
Each prints is individually signed by the artist and TWO holders of the Victoria Cross.